“Once a tree is damaged, it’s the beginning of the end. But once a redwood is damaged, it’s just the beginning,” Robert Van Pelt says. He explains: the secret to a coast redwood’s longevity is its rot-resistant heartwood, the tree’s dense inner layer. Van Pelt, a forest ecology researcher and affiliate assistant professor at the University of Washington, specializes in big trees, and lately, he’s been focused on a secluded one-acre parcel located in Big River Watershed, the Fritz Wonder Plot. Fritz returned to the Wonder Plot every ten years between 1923 and 1983. He recorded tree mortality; measured diameter at breast height (which is four and a half feet off the ground); estimated trees’ height and volume; and monitored soil deposition and vegetation on the forest floor. After his death (at 102 years old), researchers from Humboldt State University conducted measurements in 1995 and 2005. Now the Fritz Wonder Plot is one of the most extensive records of coast redwood forest growth after clear-cutting. 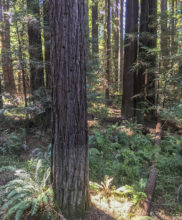 In 2002, Mendocino Land Trust (MLT), with help from Save the Redwoods League, acquired 7,334 acres of redwood forest in Big River Watershed, including the Fritz Wonder Plot. Soon after the acquisition, MLT successfully transferred the property to California Department of Parks and Recreation, under an agreement to permanently protect the property. Now, in this new decade, it’s Van Pelt’s turn to measure the Wonder Plot. Today, the forest looks like a primeval landscape, but people left their mark: Ferns carpet the forest floor and also perch on massive redwood stumps. According to Van Pelt, trees in the Fritz Wonder Plot are the tallest second-growth redwoods in existence. Some loom over 250 feet. The plot sits on a floodplain, which is flat and contains nutrient-rich soil — ideal conditions for rapid growth. This year, Van Pelt and the League’s Forest Fellows are taking new measurements, like trees’ crown volume, in addition to the regular suite of measurements used throughout the last century. Knowing crown volume, for example, helps researchers predict other aspects of the tree, like overall mass, which are hard to measure directly. The team also employs LIDAR, a method that generates detailed aerial images. To capture these images, a helicopter hovers overhead and beams lasers at the ground. The lasers bounce off the landscape, collecting information about the topography and trees’ positions. The resulting LIDAR images are dotted with bright orange blobs — representing the tallest trees — concentrated within and around the plot. In 1923, Emanuel Fritz counted 272 trees within the plot. Seventy-two years later, in 1995, only 113 trees remained. It’s a good sign: the forest is thinning out, transforming into a grove with fewer but bigger and taller trees, which is a characteristic of old-growth redwood forests. Hopefully, we will see this trend continue for decades to come. Madeleine Turner grew up near Los Angeles and holds a degree in Ecology and Evolutionary Biology from UC Santa Cruz. When she isn't writing, she's reading or running under the redwoods. Life can be hectic. You have school, work, and responsibilities to take care of. Add a busy city with thousands of people and your life is even more chaotic. Find out how Muir Woods can help you slow down while keeping you immersed in the city vibe. Spend the day after Thanksgiving outdoors in California’s spectacular redwood state parks! Save the Redwoods League and California State Parks are offering free, downloadable vehicle day-use passes to more than 40 redwood state parks for use on November 24, 2017. The passes are going quickly, so reserve and download yours today at RedwoodsFriday.org.